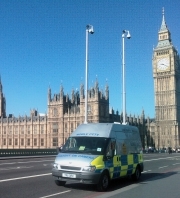 Our advanced Mobile CCTV Unit is purpose-built and fully-equipped with two controllable CCTV cameras. The CCTV cameras are designed for outstanding image capture and recording in all light conditions. Images can then be wirelessly transmitted to your control room for real-time monitoring � either to supplement static cameras or on their own. Read more about our Mobile CCTV Unit in action with our Brands Hatch case study.